I love when I see a company that is as focused on having fun as they are providing great products for our industry. Beauty Society is just that – a super fun company that offers top of the line skin care that is as good for your skin as it is for the environment. Beauty Society Products are made from high-performance ingredients formulated to combat aging, acne prone, sensitive and problematic skin issues to keep everyone’s skin looking healthy and vibrant. In addition to giving great results, Beauty Society Products are Paraben free, sulfate free, cruelty-free, gluten-free, vegan-friendly and made in the USA. Independent Beauty Society Consultant Danielle Fraher sent me her favorite product for review in this year’s Christmas in July Gift Guide. The Crystal Ball is a weekly microdermabrasion treatment that gently but effectively sloughs off dead skin cells to reveal bright, fresher looking skin. Pumice crystals gently help buff away signs of sun damage, discoloration, enlarged pores and acne scars, leaving your skin visibly brighter and smoother in just a few weeks. A little goes a long way and even my sensitive skin had no problem with this gentle treatment. I even loved how it smells! I have only used it a few times, but I am excited to see the results after continued use! 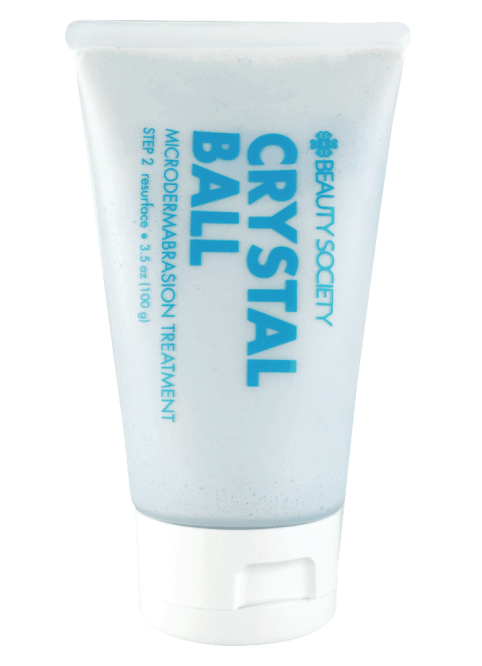 Another perk – the Beauty Society Crystal Ball comes at a fraction of the cost of most microdermabrasion products! You can’t beat that! You can earn free products hosting a Beauty Society Event by sharing these great products with your friends and family. You can check out Danielle’s website to learn more about how you can get involved with Beauty Society.